...Peel checked the NMRs’ cryogen levels and found that although the nitrogen needed topping off, the helium was still okay. Now the team had a decision to make: Keep the NMRs going, or discharge the magnets in a controlled manner and bring them up to room temperature. As long as the school had access to liquid nitrogen, which it did, they could keep the instruments running. But just because they had liquid nitrogen didn’t mean they’d be able to get it to the NMRs. Without electricity, the elevators didn’t work. During that visit, the team used a cherry picker to lift a tank of liquid nitrogen to a terrace with access to the 500-MHz instrument, but that was a solution no one saw as safe or sustainable. The team weighed its options. Discharging the magnets wasn’t a trivial operation. It would take some sort of power source—a car battery, for example. And without liquid helium on hand, they couldn’t be sure the magnets wouldn’t be damaged in the process. The chemistry department didn’t suffer any extensive losses to research. The biology department and researchers at the medical school were not so lucky. McPherson says he didn’t even think the story of the NMR rescue was noteworthy until he learned that every other university in New Orleans with superconducting NMRs had lost their magnets to quenches. As for lessons learned, the school now keeps a large stock of liquid nitrogen on hand during hurricane season, and it has a much more detailed emergency plan. Most faculty have an emergency contact number outside New Orleans and an additional e-mail account that’s not linked to Tulane. Hardening facilities for natural disasters is probably not so high on folks' priority lists, but it definitely is worth some thought. Jean-François Tremblay is on the cover this week, talking about the health (?) of the Chinese chemical industry. Does anyone actually believe Chinese GDP numbers? I think you can believe the trend, but not the actual number. Interesting article by Marc Reisch on SABIC's CEO, Abdul Aziz Al-Zamil. Some interesting backstory on the carcinogenicity of DEHP in this week's letters to the editor. Voting for the funniest, most accurate description of an analytical technique closes tonight at midnight Eastern. Go vote! This thread at ItP has gone in an interesting direction, where facts are being examined from multiple perspectives. I confess I'd never heard of the "findenser" before. Interesting to see a chemical manufacturing industry critic on the DuPont LaPorte incident. Beryl Lieff Benderly has more of Dr. Naveen Sangji's comments at ACS Boston. I enjoyed this post of See Arr Oh's; surprising to me to see that it wasn't only Gomberg trying to reserve fields for themselves. Jyllian's roundup of the latest in the Journal of Chemical Health and Safety. Mitchell's post on George Whitesides' ACS Boston talk. Loved this Melanie Nelson post on the "people behind the scenes." Renee Webster sees some funny-looking molecules. The story of a former chemist and now woodworking entrepreneur. Readers, any other posts in the chemblogosphere need attention? Do you have a new chemistry blog to plug? Here's the place to do it. UPDATE: From the comments, I missed this piece by Ash (which I think is really important) on livetweeting scientific conferences. I'm reminded an episode of one of my favorite old shows "The Unit", where the youngest operator on the team grazes a senior operator in the arm during a training exercise. After giving Bob a thorough razzing, they congratulate him on reaching his "200th hour"* where he has "enough experience to be confident, enough to screw up real good." *Apparently this is flying terminology? Biotech cluster setup? Don't even bother. ...He called a rare special session of the Legislature to approve the state’s share of the Scripps package — $310 million plus interest over 10 years — and won easy approval from the county government to spend more than $200 million. To make his case, he circulated a five-page economic impact study that said Florida could build a biotech economy every bit as impressive as the one that took decades to germinate in San Diego, only faster and bigger, with potential to add more than 40,000 jobs within 15 years of operation. Twelve years later, those dreams have not come true. Florida employed 27,611 people in biotech last year, according to the state’s Department of Economic Opportunity, or just 952 more people than it did in 2007, the last year for which the state has comparable data. Scripps accounts for many of those jobs, with a head count of 646 people in Florida. The data do show a doubling in the number of biotech establishments. And Scripps says it has attracted $425 million in federal grants and donations. But the promise of Florida’s investment was about a jobs bonanza from spinoff companies. Bush was captivated by the Scripps headquarters in La Jolla, a tony San Diego suburb where 2012 GOP presidential nominee Mitt Romney owns a home. The institute and its satellite offices are located along Torrey Pines Road, a verdant stretch connecting it to the famed golf course of the same name as well as sandstone coastal bluffs and the ocean. The biotech boom around Scripps is hard to miss. Science and medical companies dot the area. First, does anyone who has experience in the Jupiter area disagree with the article's assessment? Is it too early in the game to make a call? Even the cities that do have these things (I'm looking at you, San Diego, RTP) have not done nearly as well in the last 20 years as San Francisco and Boston/Cambridge. It's a mug's game and I think that Florida is only one example. Monsanto was also quick to see the market opportunity. The company had grown with the production of 2,4-D and its descendant 2,4,5-T, which were then combined to produce Agent Orange to defoliate forest cover during the Vietnam War. In 1970, in an effort to come up with an even stronger plant killer, Monsanto chemist John E. Franz hit upon an herbicide called glyphosate, which was marketed under the trade name Roundup and had seen unmatched growth in broadleaf weed control in the agricultural industry. The only problem with Roundup: It was such an effective herbicide that farmers had to apply it carefully, spraying only early sprouting weeds, to avoid exterminating their crops. The article legitimately questions whether or not the FBI should be using the Foreign Surveillance Intelligence Act to track foreign nationals performing industrial espionage within the United States. It seems to me that the most ideal scenario would be a new set of laws granting surveillance powers to federal agencies that are tasked with preventing industrial espionage from other nations. But asking for new laws these days seems like asking for a pony*, so we're probably going to muddle through with what we have. *Not that I really want a lot of new laws, I note. What is it like to work at the DEA? Does anyone know what it is like to work at the bench as a forensic chemist for the DEA? What kind of postings can you expect, etc? A good deal of a forensic chemist’s work is instrumental analysis, says Darrell Davis, laboratory director at the Drug Enforcement Administration’s (DEA) South Central Laboratory in Dallas, Texas. Davis has been a forensic chemist for over 29 years with DEA, originally on the bench analyzing samples for the presence of controlled substances at the Southwest Laboratory in San Diego, and later managing the DEA lab in Dallas. Anyway, anyone have any experience they'd like to share? Torrance, CA: Medical Chemical Corporation has, once again, a production chemist opening. Interesting: Never seen an ad from "Commissioning Agents, Inc" before; they do a lot of regulatory-related work at API plants and the like, I believe. Watertown, MA: Wolfe Laboratories looking for a senior director of pharmaceutical development. Just a little experience needed. 652, 9518 and 15 positions for the search term "chemist." LinkedIn shows 768 positions for the job title "chemist", with 74 for "analytical chemist", 24 for "research chemist", 12 for "organic chemist", 4 for "synthetic chemist" and 3 for "medicinal chemist." Your shower shoes have fungus on them. You'll never make it to the bigs with fungus on your shower shoes. Think classy, you'll be classy. If you win 20 in The Show, you can let the fungus grow back and the press'll think you're colorful. Until you win 20 in The Show, however, it means you are a slob. The percentage of ACS members in academia is now at 38%, up from 24% in 2004. The percentage of Industry (manufacturing*) ACS members is 42%, down from 54% in 2004. The % in industry (non-manufacturing, govt and self employed) has remained relatively flat over the decade at 12%, 7% and 2% respectively. The ChemCensus response was about 24,000, or ~33%. ACS has an 84% retention rate; with a churn of ~25,000 members not renewing (a few hundred die every year). Half of that 25K is students, we are told. The loss of industrial members is not particularly surprising, but is disappointing nonetheless. Here's hoping for a renaissance. *This definition is pretty broad and self-reported, as I recall. As part of a talented and multi-disciplinary team advancing an exciting new approach to oncology drug discovery and development, the successful candidate will participate in discovery synthetic chemistry efforts aimed at identifying and developing novel linkers, payloads and linker-drugs technologies for preclinical evaluation and clinical use. The successful candidate will have strong synthetic skills, outstanding attention to detail and excellent record keeping abilities. Contribute to development and optimization of analytical characterization methods for linker-drugs. Contact dane[dot]holte[at]stemcentrx[dot]com (note spamproofing) with CV and cover letter for these chemistry positions. Also, a link to all the available positions at Stemcentrx. Over on the Division of Chemical Health and Safety's listserv, they're asking about the price of 60 L of helium. Anyone want to cough up their price in the comments? Also, anyone have any screamin' good deals they want to brag about? Create a 2-3 minute video that conveys the value of Organic Division Membership. Qualifying videos will be posted to the ACS DOC YouTube Channel (http://tinyurl.com/ORGNYouTube) for viewing by the public and judges. Here's a link to the full details of the contest. Best wishes to those interested. 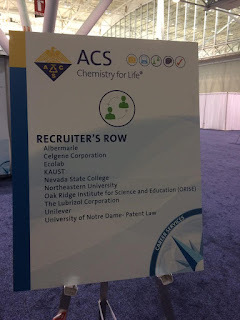 Seems to me that the real value of Organic Division membership is that you can participate in ACS activities related to the Organic Division (the Symposia, that sort of thing.) I sure wish that you got your copy of Organic Syntheses in the mail still. That said, access to the videos from the National Organic Symposium (scroll down) is indeed something of value that I am really happy that DOC has taken on. Definitely worth my $15. Aberdeen Proving Ground, MD: The U.S. Army Research Lab is looking for a "Director, Weapons & Materials Research Directorate." Sounds fascinating; pays 121,956.00 - 183,400.00. Unknown whether or not you will be reporting to "Thunderbolt" Ross. Louisville, KY: Hexion desires an experienced M.S./Ph.D. chemist to be a product development chemist. Owensboro, KY: Bet you didn't know that there were chemists (?) working on Swedish snus. Wonder why the microbiology background? Iselin, NJ: BASF looking for a B.S. chemist; looks to be analytical in nature. New Orleans, LA: Xavier University of Louisiana is holding what appears to be an open search for a biochemistry faculty position. Berkeley, CA: UC-Berkeley advertising for an associate/full professor position in experimental physical chemistry. Crawfordsville, IN: Wabash College looking for an assistant professor of analytical chemistry. San Bernardino, CA: California State University San Bernardino is looking for an assistant professor; "Specialization in bioanalytical chemistry, biomaterials chemistry, or environmental chemistry is desired." 60-70k offered. "Liberal Arts College": Colorado College looking for an assistant professor of chemistry; organic/bioorganic concentration desired. The joint Chembark/Chemjobber 2016 faculty jobs list stands at 161, with 11 new positions added. From the inbox, a darn good question - how do you get rid of 25 grams of AIBN that needs to be disposed? Any ideas? I would usually recommend that people look in Prudent Practices in the Laboratory, but that doesn't offer any suggestions. Earlier this year, a University of California, Berkeley, first-year chemistry graduate student synthesized about 1 g of a diazonium perchlorate compound (R-N2+ClO4–) as part of an effort to explore the effect of the perchlorate ion on a reaction. Working at an open bench and wearing regular prescription eyeglasses, he was using a metal spatula to transfer the material out of a porcelain funnel when the compound exploded. Porcelain fragments shattered the lenses of his glasses and lacerated his left cornea and his face. The student required surgery on his eye but was not permanently injured and is back in the lab. He knew he was working with an explosive and followed appropriate safety measures for most of the experiment, but at the end, “he became a little complacent,” says the student’s adviser, chemistry professor F. Dean Toste. The student should have worn safety glasses and used a nonmetal spatula for the transfer. Toste and UC Berkeley Office of Environment, Health & Safety Executive Director Mark Freiberg have worked together in the months following the accident to figure out what to do to try to prevent other similar events. “We look at it as systemic failure,” Freiberg says. “We’ve spent a lot of time with this student and others in the lab, trying to explore this incident and glean from it as much as we can about how our current, fairly extensive efforts to improve safety were ineffective in this instance...."
Back when we discussed this in June, I was a bit confused as to why the graduate student made as much as they did. 1 gram seems like a lot. Doesn't look like we got any answers on that question. There are two separate issues here. First, it's cynically amusing to me to see that the organization has all the paperwork lined up that says "we told you to do it correctly." While UC-Berkeley has been legally protected, somehow the student was still in their lab, using the wrong equipment, wearing the wrong PPE. Secondly, I have a question about the massive, massive problem in both academia and industry of wearing prescription glasses as pseudo-safety glasses in the laboratory. * I bet you that we could walk into any chemistry laboratory within 100 yards to 50 miles of where you are sitting here reading this, and we'd find someone breaking this common sense rule. While I think Berkeley is being very gallant in picking up the difference in costs for prescription safety glasses, I think this is a paper solution, just like the SOPs. What can we do about it? Readers, any suggestions? *As a young graduate student, I decided to transition from prescription glasses to contacts to avoid the temptation of wearing prescription glasses in the laboratory and thinking "I am still protected here." Any vanity on my part, or that I was single at the time is strictly coincidental. This week's cover article on the overlap between oncology treatments for dogs and for people. Jean-François Tremblay and Marc S. Reisch have C&EN's coverage on the Tianjin explosion; no mention of calcium carbide, but they do mention ammonium nitrate. Fun article on 3-D printing molecular models by Matt Davenport. Does anyone else feel like this is a field that's waiting for someone to just take it over and make a ton of money? "Troubleshooting that alarm fell to a rookie operator named Crystle Wise, a 53-year-old, dog-loving, Harley-Davidson-riding grandmother with electric blue eyes. By chance, Wise had chosen to take her break in a spot dubbed the “smoke shack”—between the control room and the pesticide tower. Wise, one of the latest hires in the plant’s recent wave of turnover, was still finishing her nine-month training period with DuPont. She donned her safety helmet and goggles and grabbed an oversized wrench. Then she crossed a covered passageway to the Lannate tower and opened a heavy metal door that led to a stairwell. She headed for a complex set of valves on the third floor, to clear the clog and relieve the stress on the pipes—and on the rest of the crew. What Wise didn’t know was that she was walking into a disaster." I tend to agree with the "Swiss cheese" model of accident analysis - in this case, you can really watch the holes line up. More on this later. Also, does anyone have a good article on the Tianjin incident? I know there's a lot of sodium cyanide in the destroyed warehouse, but that doesn't explain the initial explosion. It's taken almost two months, but finally, below are the entries for the contest for the funniest, most accurate description of an analytical technique. Biotechtoreador's NMR description: "Stick your molecules in a tube, then stick the tube in a magnet so the dipoles in the atoms in the molecules line up. Turn on a radio, and the atoms sway to one side while dancing with each other. Turn off the radio and watch as the dipoles in the atoms dance back. Repeat until you can draw it yourself." Anon071720151225PM: "NMR is the chemical equivalent of StoryCorps. Tune into the right frequency and you'll learn something about a specific situation that can also teach you something broad and fundamental about the environment in which it occurs. NMR is like radio-frequency-based molecular Twitter. Hit your sample with one short, pointed "statement" on a given frequency and then sit back listen to all the related nuclear opinions that come back at you. Fair warning: lot of it will just be noise." Anon071720151225PM: "Sum frequency generation, where a surface becomes a Thunderdome: two frequencies enter, one leaves." Brandon Findlay: "Dr. Evil: Alright, here's the plan. Here's the plan. Back in the 60's, I had a mass spectrometry machine that used, in essence, a sophisticated laser beam which we called an "Ninja Assassin." Using these "Assassins," we superheat the sample of interest "Bound" to a base coating of aromatic compounds, which we scientists call "The Matrix." "Animating the Matrix" creates a superheated plume of gas containing every ion in the sample, a "Cloud Atlas" if you will. By timing the "Speed" at which ions "Race" to the detector we can determine their mass with incredible precision. "Reloading the Matrix" with new analyte allows the same detecting plate to be used multiple times, lading to massive profits and a "Matrix Revolutions" in mass spectrometry. Scott: Why did you pluralize the word revolution and use so many air quotes? Dr. Evil: It's a V, for Vendetta, not an air quote, Scott. Okay? Dr. Evil: Any ways, the key to this plan is controlling the rising gas. Like "Jupiter Ascending' it can quickly overload detector without proper safeguards. Because overall futuristic flair, and the polish source of "The Matrix", we shall call the device the Wachowski Starship. Number Two: [pause] That also already been created. It's called MALDI-TOF. Dr. Evil: Right, people you have to tell me these things, okay? I've been frozen for thirty years, okay? Throw me a frickin' bone here! I'm the boss! Need the info." Pete: "NMR- play BBC radio 3 at your sample, and record the screams." The Iron Chemist: "EPR is like NMR but with electrons." Peter Edwards: "IR is like a TV remote control. You shine an IR source (spectrometer or remote control) at your sample (chemical or TV), and the signal that you get in return doesn't usually tell you anything useful that you don't already know." Molecular Geek: "FT spectroscopy is like listening to a grand piano crashing to the ground from a 10 story drop in order to determine which notes were out of tune." The retention times of compounds may change as the stationary phase changes due to deposition of residues from dirty samples and reaction with oxygen from leaks. For compounds with similar mass spectra (e.g., xylenes) errors in identification may occur. This usually only happens when data are to be published or the sample is a PT sample." SeeArrOh: "Sit down by the fire, kids, and let ol' See Arr Oh tell you about the spectral technique every O-chemist loves: Proton-decoupled carbon-13 NMR. You see, back in the 1950s, gents in well-tailored suits with big glasses posed next to giant, room-filling machines capable of only a fraction of today's tablet computers' power. These men - and they were always men, then - would place thin glass tubes of their molecule into relatively misshaped magnetic fields and send in specific radio waves, hoping out the other side to see their recorder pens transcribe a forest of little inky peaks. Now, this worked fine if you wanted ALL the information about each and every proton in the molecule, but what if all you wanted to do was count carbons? Sending in radio waves tuned to carbon sent back little patterns of 2, 3, 4 (or more) peaks, depending on how many Hs were bound to each C. Too much info! Instead, if you blast all the protons with one high-powered radio pulse, their coupling to C falls apart, and you can sneak in a carbon-only pulse just afterwards. Et voila! Simple, single peaks shifted to match the chemical environment of where you found 'em in the molecule. Carbons next to things that tug on their electrons are on your left. "Saturated" carbons with lots of protons or buried deep with other carbons are on your right. Easy as pie." Unstable Isotope: "You put your precious sample in a complicated machine and out come lines of great meaning. (This applies to multiple spectroscopy techniques.)" ForensicToxGuy: "Time of flight mass spectrometry is akin to a foot race between skinny kids and heavier kids. They all start approximately at the same starting line. The gun goes off and the race starts. The lighter kids travel faster and the heavier kids are slower through the race course. The skinnier kids get to the finish line first while the heavier kids finish later. I can say all of this because I'm a fat kid." You take an irreplaceable archaeological artifact, smash it, pour acid on it, burn it, then catapult any remains as fast as current technology will allow." standrewslynx: "NMR spectroscopy is like making love to a beautiful woman. You start vertical, but then get excited and end up horizontal. Then you roll around a few times...and relax." Jon Lam: "So imagine you're a circus performer in a room, standing by the doorway. Your act consists of you holding a fairly large butterfly net, ready to catch what ever miniature clowns run through that doorway. But the mini clowns don't actually run in, they are actually being shot out of a cannon. Through the door. Into your net. But your cannon is kinda crappy so if the clown is too big, it just kinda plops out of the cannon and doesn't make it very far... Probably won't even make it through the doorway. But if the clowns are small, they get launched from the cannon with impressive speed... Probably too much speed so that when you try to catch them, they rip the net right out of your hands and keep going on their trajectory straight into the audience, perhaps into that section of nuns. It turns out, for the trick to work allowing the audience to see your daring clown capture, you need clowns of just the right size. Since you don't have a scale, the only way to find clowns of the right size is trial and error. This is essentially how a magnetic sector mass spec instrument works." That’s what it’s all about." because passing CHN is Hell." Irvine, CA: This information analyst position with Allergan is fascinating, in that it doesn't require a master's in library science degree; instead it asks for a Ph.D. w/10+ years experience. Beverly, MA: RAN Biotherapeutics is looking for a B.S./M.S. synthetic chemist. 35-55k, that doesn't seem like much? Cambridge, MA: Warp Drive Bio is looking for a B.S./M.S. research associate for LC/MS work towards their natural products work. A broader look: Monster, Careerbuilder, Indeed and USAjobs.gov show (respectively) "1000+", 635, 9,384 and 19 positions. LinkedIn shows 791 positions for the job title "chemist", 75 positions for "analytical chemist", 31 for "research chemist", 12 for "organic chemist", 5 for "synthetic chemist" and 3 for "medicinal chemist." The American Council on Science and Health is looking for a Director of Life Sciences. We are a 37-year old 501(c)3 non-profit organization. Our mission is to debunk junk science and medicine, especially as it pertains to public education and policymaking. We are a small, but rapidly growing organization. This means so we all have responsibilities that are in addition to the our primary positions (editing, recruiting, and managing large projects, whatever it takes). This is a full time position with benefits. This is an in-office job. It will be necessary to work out of our office in Manhattan. On rare occasions, working from home will be appropriate. We are looking for a high energy, imaginative individual who will do whatever is necessary to help us grow. In return, you will have a challenging, exciting and fun job that will have you looking forward to getting to work in the morning. Best wishes to those interested. My thoughts on Dr. Naveen Sangji's comments at ACS Boston got long enough that I decided to write a separate post about it. The silent ivory tower: First, she is absolutely right that the academic chemistry community has closed ranks. There have been few prominent chemists who have directly criticized either UCLA or Professor Harran. (From an online perspective, it's especially silent.) I don't run in academic circles anymore (not that I really ever did), so it's hard to say what kind of conversations about Prof. Harran's or UCLA's culpability have taken place during group meetings and the like. New details on the incident: I'd like to hear more details that Prof. Harran asked her to perform the tBuLi syringing without the appropriate equipment (what equipment would that be? Certainly one could unpack a cannula and a graduate cylinder.) Personally, I think it's more likely that Prof. Harran asked her to do the syringe transfers and that he never thought that anything bad could have taken place. Her interactions with the ACS Board: I am curious to hear about her interactions with the ACS Board of Directors to see if they'd make a public statement. How would someone even begin to pressure the board to act? E-mail? I can't imagine that they ever would have. They seem to shy away from that sort of controversy. The policy proposal: Dr. Sangji believes that the ACS should advocate for the NIH to include an evaluation of a PI's safety record on funding proposals. While I agree that funding is certainly the only true coercive power that the NIH has over the universities, I repeat the same criticism of this potential policy that I have long made (when it was brought up by Beryl Benderly, back in 2009): How is it possible to accurately judge a PI's safety record? How do you get accurate data? How could you possibly avoid the inevitable sweeping under the rug of near-misses and actual safety incidents in order for professors, postdocs and students to continue to get funding? If I was a graduate student that had an accident and I knew that going to the emergency department for stitches meant that I'd be jeopardizing the future funding of my PI and my coworkers, I'd be sewing cuts up myself to avoid the potential damage to my career. Apart from my policy critique, I believe that Dr. Sangji has a fundamental misunderstanding of the ACS and its relationship to the academic community. It's an organization that derives most of its Society-wide funding from ACS Publications, a publishing house which gets its work product, for free, in raw form from the academic community and then charges those same academics for access to its journals. Why would ACS ever decide to jeopardize this relationship over what is (in the ACS headquarters' eyes, I suspect) an internal employee safety dispute of its chief customer? Get federal OSHA to place academic laboratory safety as one of its top enforcement priorities. Pressing her sister's memory on each and every member of the American Chemical Society is tremendously important from a cultural perspective, but in this nation of laws, it's Congress that holds the true power. *And this power may be declining over time! Naveen went on to reveal new details about the case, relaying Sheri’s remarks in the hospital that Harran had asked her to perform large-scale experiments without appropriate equipment, which was packed away in boxes. ‘Sheri stated quite clearly at the burn centre that Patrick Harran had explicitly instructed her to carry out three transfers of 50 cc of t-butyl lithium using a 60 cc syringe,’ Naveen said. As for her sister’s failure to wear a lab coat during the fatal experiment, Naveen said she was likely never issued such equipment. In 2009, Naveen requested that the ACS Board make a public statement condemning Harran’s behaviour, which she claims includes destruction of evidence and refusal to make full disclosure. The organisation’s executive director and CEO at the time, Madeline Jacobs, declined to publicly comment on the matter. Naveen urged ACS’ current executive director and CEO, Thomas Connelly, to make such a statement, and go even further. Specifically, she wants Connelly to write an open letter to the head of the NIH, Francis Collins, advocating for that a PI’s safety record be considered in the agency’s peer review process. ‘The ACS has tremendous power, and with that there is responsibility to protect the young scientist you hope to nurture,’ Naveen stated. ‘What the NIH adopts, other funding agencies will follow.’ She said that PIs are busy, and funding is chief among their priorities. ‘Tie funding and safety together, and change will happen overnight – future generations of scientists will be better protected than Sheri was,’ Naveen asserted. I've been keeping records on-and-off since April 2009. This is the third best ratio since then, I think (3.69 job seekers to jobs, top being ACS Boston in 2010 at 2.2-to-1). This is the 3rd largest absolute number of jobs (Boston 2010: 484, Denver 2011: 261). Graduate students employed by the University of Missouri will have a harder time paying for health insurance after MU told students Friday it is taking away subsidies that help with premium costs. MU Associate Vice Chancellor for Graduate Studies Leona Rubin said the change is the result of a recent IRS interpretation of a section of the Affordable Care Act. The law, which requires adults to have health insurance or face tax penalties, “prohibits businesses from providing employees subsidies specifically for the purpose of purchasing health insurance from individual market plans,” the university said in a letter sent to students Friday. The IRS, Rubin said, considers the university’s student health insurance plan from Aetna an “individual market plan.” Because of the IRS classification, the university cannot give graduate students with assistantships a subsidy to help with health insurance costs, Rubin said. If the university continued to do so, Rubin said it could be fined $36,000. “We’re trying to comply with the interpretation of federal law,” Rubin said. “We’re not trying to hurt” students. MU is using the $3.1 million it had budgeted for graduate student employee health insurance subsidies to create one-time fellowships for those employees. All graduate students with qualifying titles — a group that includes teaching assistantships, research assistantships and fellowships — will be eligible for the one-time fellowship this fall. “We wanted to make sure the students who needed insurance had the money ... in the fall,” Rubin said. I am told that the graduate students were given less than 24 hours notice of this change. Suffice it to say this is an interesting and probably not desired outcome of the Affordable Care Act and one of the reasons that I am, in general, pretty skeptical of most federal legislative efforts. It's rare that anyone can accurately predict second- or third-order effects and it always seems like there will be small (or big) groups of people who are negatively affected by these massive legal and regulatory shifts. I can't imagine that Mizzou chemistry grad students make much; I suspect this won't help their recruiting for the following year. (I suspect that they will be planning to increase their stipends for the following year?) Best wishes to the affected Mizzou students. Hanover, NH: Avitide is looking for bioprocess R&D chemists (2-4 years experience desired.) Gotta say, is there any downside to living in Hanover, NH, other than the lack of an MLB team? Azusa, CA: Norac Pharma is looking for a B.S./M.S. process chemist. Hannibal, MO: BASF has a QA/QC managerial position open. M.S./Ph.D. with experience desired. New York, NY: Interesting that Roche is hiring a PK/PD postdoc - I wonder what happens to these folks. Wasco, CA: Who knew there were fermentation process R&D managers? B.S. and 3+ years experience desired. Wuhan/Shanghai, China: QR Pharma has posted a variety of positions for those interested in working in China. Latest update: There are 108 positions on the joint ChemBark/Chemjobber 2016 faculty jobs list. Lubbock, TX: Texas Tech University is looking for an assistant professor of chemistry, specializing in "experimental soft matter." Associate/full professor applications would be entertained. New York, NY: NYU is looking for a professor in experimental physical or biophysical chemistry as part of its Laboratory for Molecular Nanoscience; all levels entertained, but they expect to hire an assistant professor. College Station, TX: Texas A&M has an all-areas, all-ranks ad out. Middlebury, VT: Middlebury College is looking for a laboratory instructor for a 3.5 year appointment; wonder where people go after they take this position. M.S./Ph.D. desired. Auburn, AL: Auburn's School of Pharmacy has an ad for a synthetic/medicinal postdoctoral position. Philadelphia, PA: The University of the Sciences is looking for an assistant professor of organic or inorganic chemistry. Stanford, CA: Stanford has 2 openings for staff radiochemists; B.S. in chemistry minimum. Within the bounds of respectfulness and privacy, I want to comment further (and briefly) on C&EN's recent layoff of eight production staff and reporters. With today's issue, the Chemical and Engineering News masthead no longer has Sophie Rovner or Susan Ainsworth's names. This represents 67% of C&EN's reporters covering what I tend to call #chemjobs issues, with the third being the excellent, indefatigable Linda Wang. They have been doing a fantastic job covering the negative effects of the Great Recession on the ACS' member chemists. I do not understand why this choice was made, but regardless of the reason, the effect is the same. I sincerely hope that C&EN will continue to cover chemical employment issues with the same quality and quantity as they have before. Best wishes to Susan and Sophie, C&EN and to all of us. Our/my hope is to make things easier for people who are applying. Click here to see the list of current positions at ChemBark; here is the current list in downloadable spreadsheet format. Please send Paul (paul at ch____rk.com) or I (chemjobber@gmail.com) new listings, unlisted positions or corrections. Finally, I want to note that this was 100% Paul's idea and I'm honored to be recruited for the effort. ...Relying on foreign contractors is part and parcel of the business model of many of the “virtual” pharmaceutical research companies that have emerged in the past decade or so in the U.S., Europe, and other parts of the world. Jay Wu, president and CEO of VM Discovery, in Fremont, Calif., says that not having labs helps to secure a more stable career path for his research managers. “Being a lab researcher in California can be very depressing,” Wu says. Owing to their limited venture capital funding, most small biotech companies in California work on only one compound, and if that candidate fails to advance to clinical trials, as is usually the case, then everyone at the company is laid off. But if the compound beats the odds and succeeds in progressing to the clinical trial stage, the entire early discovery lab is laid off anyway. “Either way, most scientists are looking for work every three to five years,” he says. I don't work in the virtual space enough to understand how well this works out for companies; I guess it's about embracing the instability, sigh. Here's Lauren Wolf's opening essay. A survey on how chemists use the Internet. I love this Martyn Poliakoff piece on the periodic table and the Web. Carolyn Bertozzi talks about online serendipity. Derek Lowe's comments on the chemistry blogosphere and the literature. Here's Paul Bracher's piece on ChemBark. Comments on the job market by some rando. This story on new beryllium safety standards by Andrea Widener is interesting - I had no idea that it was used outside of nuclear weapons. Bethany Halford covers work by the Buchwald group on embedding air-unstable compounds in paraffin capsule. It's so simple, I feel dumb for not having thought of it before. Anyone want to plug anything at ACS Boston? I see Deborah Blum will be speaking on Monday afternoon. Friends of the blog Raychelle Burks and Matt Hartings (among others) will be speaking on a panel on Monday as well. There's a University of Minnesota-run polymer chemistry symposium on Tuesday. Don't forget the Technical Achievements in Organic Chemistry symposium on Wednesday. Friends of the blog Integrated Chemistry Design (makers of Asteris and ChyrisDraw) will be at booth #1225 at the expo. Wish I could be there! Maybe in San Diego? Update: A few chances to meet fotb Organometallica. Also, I understand there will be a chemistry Twitter meetup on Monday night. For a couple of years now, I have been involved with the DIY Science Zone at Geek Girl Con. This is an annual science fiction convention; prominent online science communicator Raychelle Burks has been putting on the Zone, where children (and adults) are invited to interact with hands-on science demonstrations and the like. It's a lot of fun and I have enjoyed participating in it. We do a lot of fundraising for the Zone for supplies, etc. One of the things we're supposed to do is Acts of Whimsy when we meet certain fundraising goals. Because we reached $1500, I did a dramatic reading a portion of the infamous arsenic life paper. A commenter noted that the reading was not exactly in the spirit of Geek Girl Con; I agreed and so I convinced someone I know to read a book that is much more relevant to the ideas behind Geek Girl Con and the DIY Sci Zone. The book is "Rosie Revere, Engineer" by Andrea Beaty. Hope you enjoy. If you feel like donating, here's a link. CAMBRIDGE, Where Else? (Chemjobber News) It sounds like something out of Medicine Man, but it's true. In a study published today in the journal Science, researchers have announced the discovery of the "Holy Grail" of chemistry: a machine that eliminates bottlenecks. Textbooks will need to be shredded as the research challenges the long-held notion that bottles require necks, or that any container requires a narrower opening. "The findings truly are astounding," said lead author of the paper, Professor Jones. "It's taken a lot of hard work and long nights in the lab, but I'm glad that this work is finally out there. We have destroyed all known bottlenecks. They're gone. That Diet Coke bottle you had in your office? Get it within two feet of our machine and it'll be a cup. Aldrich 4 liter bottles are gonna be jars from here on out." The scientists' work is a silver bullet for a problem known to many people around the globe who hate the "glug-glug" of pouring things and is the key to unlocking a mystery that paves the way for research in this emerging interdisciplinary field, namely how to possibly get funding in a 13% payline world. The breakthrough is sure to be heralded as good news for managers who love to prattle on about "de-bottlenecking". But some will be asking questions about the need for this research in our increasingly open-top, all-access society. Dr. Smith, who was not involved with the research, says that the results are "intriguing" but there is not yet enough information to draw any conclusions. "Surely Congress or the Pentagon has some bottlenecks remaining," he added. This is an interesting graph of a recent layoff of ~1200 employees, written up by Mike Rogoway and David Cansler of Oregonlive.com. Apparently, the employees were shown a graph of who was laid off (as part of federal law?) The actual data (XLS) can be downloaded if you click through. I would like to see the distribution of overall employees at Intel - one presumes that they would be shifted to the left a bit, but I don't really know anything about semiconductor manucturing production/R&D to speculate on the median age of the workforce. I don't seem to remember similar graphs coming out of the 2003-2013 period of layoffs in pharma - I wonder why? Sure looks like the upper end of the age distribution took the biggest hit, though, doesn't it? This layoff skewed older – considerably so. The average age of an Intel employee in the United States is 42.6. 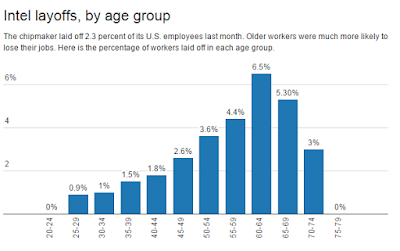 The average age of an employee laid off last month was 48.1. Workers in their 50s were 1.7 times more likely to lose their job than the average worker overall; workers in their 60s were 2.7 times more likely to be laid off than the average. Meanwhile, workers in their 20s and 30s were considerably less likely to lose their jobs. Employment attorneys say this isn't unusual, and it could be difficult to make a discrimination case in court." I gotta check out some more of the literature around this issue, see if there's more chemistry/pharma-relevant stuff. Cambridge, MA: Warp Drive Bio looking for 2 natural product chemists. Sounds pretty cool. Groton, CT: The rather wonderfully-named "FreeThink Technologies" is looking for Ph.D. principal scientists, presumably to work on their accelerated stability measurements. St. Louis, MO: Monsanto looking for a "seed treatment process specialist"; looks to be a B.S./M.S.-level position, chemistry or chemical engineering degree desired. Coventry, RI: Rhodes Technologies looking for a B.S./M.S. chemist for process development work. Apopka, FL: Coca-Cola desires an analytical chemist; all levels of education accepted, minimum of 5 years industrial experience. mass ratio, lipid class and fatty acid analysis." Yeah, that. Guilford, CT: 4Catalyzer desires an M.S. biochemist to help develop "modelocked sub-nanosecond solid-state lasers for medical products." Sounds interesting. Howell, MI: ChemTrend looking for a number of positions, including a bench chemist position. 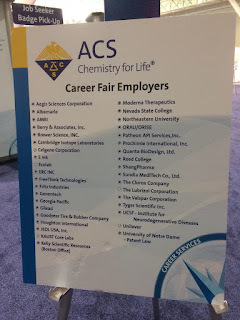 ACS Boston Career Fair Watch: 180 positions as of this morning. A broader look: Monster, Careerbuilder, Indeed and USAjobs.gov shows (respectively) "1000+", 628, 9393 and 0 positions. (Guess it's a rough week for the government.) LinkedIn shows 1534 positions for the job title "chemist", with 65 for "analytical chemist", 29 for "research chemist", 14 for "organic chemist", 5 for "synthetic chemist", and 3 for "medicinal chemist." Via Neil Withers, an ad from an Indian newspaper on the very popular Language Log linguistics blog. Even though I might be qualified, I think I'll pass on this job opportunity, thanks. ...But the FDA’s Office of Prescription Drug Promotion has ruled in a warning later dated last Friday, August 7, that those URLs were insufficient and inconsistent with the full material information required when such a drug is advertised in any medium. It turns out that this wasn’t just a happy celebrity sharing her health tips with her 40.8 million closest friends (the post alone received 464,000 likes). Glad to see that FDA is on the case. In other warning letter news, I was sort of puzzled to see that Ten Ren Tea of San Francisco received one for putting stevia into its teas? Apparently, the FDA has approved rebaudioside A for addition to drinks*, but not whole stevia leaf extract. *This feature of the regulatory state (give the okay to one specific molecule that only major multinational conglomerates can produce/purchase, disallow the extract) is a less than wonderful aspect, I think. That said, I can see the risk analysis (this molecule is okay, who knows about that whole leaf?) behind their thinking. Northboro, MA: St. Gobain looking for a senior polymer research engineer at all levels of education; experience desired. Is it Boston Week, or what? : Cambridge Isotopes looking for someone to manage their international sales - who knew there were regulatory controls on exports of solvents? Carlsbad, CA: Verdezyne looking for a senior process development chemist; looks to be extraction-oriented. Bayport, TX: Albemarle looking for a process/product development engineer. Greenville, NC: New startup company looking for a senior flavoring chemist. 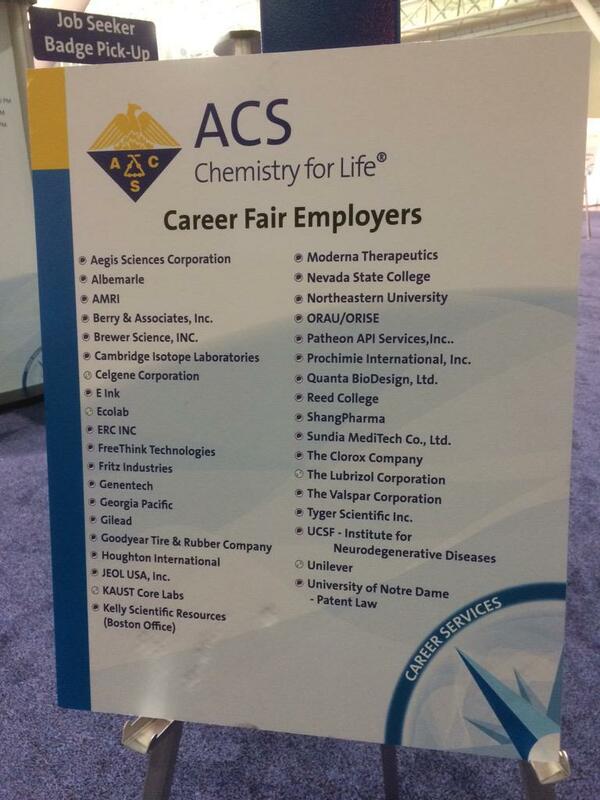 ACS Boston Career Fair watch: 173 positions listed. Applications are invited for a full-time research position in the Oak Ridge Institute for Science and Education (ORISE) Fellowship Program at the Division of Vector-Borne Diseases (DVBD), Centers for Disease Control and Prevention (CDC), Fort Collins, Colorado. The individual will participate in a broad range of laboratory activities related to the study of Lyme disease with a specific focus on the discovery of metabolic biomarkers for various stages of this infection and treatment response. This work will require handling human specimens including serum and urine, extensive computer analysis using complex software programs and the use of mass spectrometry. The selected individual should be able to perform the design and execution of experiments; the proper recording and reporting of experimental data; the writing of draft research manuscripts; and the presentation of data at scientific meetings. The individual in this position must have a Ph.D. or equivalent in the fields of infectious diseases, microbiology, biochemistry or chemistry. The selected individual will receive training in all procedures involved in the work. However, previous experience working on Lyme disease, metabolomic approaches or mass spectrometry is preferable. This is a fellow position with initial appointment for one year and an annual stipend not to exceed $62,850 depending on education and experience. Extensions for additional periods may be made not to exceed a total of 4 years. The individual may be a U.S. citizen or a non-citizen with an appropriate visa. Requested start date is September 20th, 2015. Please apply for this position at the following ORISE webpage: http://orise.orau.gov/cdc/default.html under current research opportunities. Deadline is this Friday, August 14, 2015. Click here for more details. Pittsburgh, PA: Duquesne University wishes to hire an assistant professor of organic chemistry. Tucson, AZ: Interesting bioanalytical position at Arizona's "Center for Integrative Medicine." It's part-time at the moment for $27,500.00, to be doubled to 55,000.00 pending funding. Ummmmmmm. Appleton, WI: Laurence University is looking for an assistant professor of general/inorganic chemistry. Windsor, ON: The University of Windsor is searching for a professor of environmental chemistry at any rank. Got tips to relieve grad school stress? I hate to admit it, but exercise was a good way to relieve a bit of stress for me. Sounds cliched, I know. The disease was observed for the first time in mid-1963 in Belgium (Jemeppe) in a chemical plant operated by Solvay, and affected two workers whose job was the manual cleaning of vessels used for the polymerization of vinyl chloride; similar cases occurred in almost all PVC production plants all over the world, but not in the plants where the main activity was the production of vinyl chloride monomer (VCM). Little more than one hundred cases are described in the scientific literature, and this number increases by a few dozen if we consider known but unpublished cases. These figures confirm the rarity of the disease, which peaked at the end of the 1960's and disappeared during the 1970's, probably due to the complete elimination of manual reactor cleaning. Observation of the disease lasted no more than fifteen years and the disease was not replicated in experimental conditions on animals. “Making Legal Marijuana Safe” outlined many issues with the current extraction solvent known as butane hash oil (BHO) (C&EN, April 20, page 27). This method requires a large up-front investment in closed-loop, high-pressure systems to contain and recover solvents. Safety concerns include explosion and fire risks for workers. The article then proposes a new extraction system using the greenhouse gas carbon dioxide. Although this CO2 extraction process seems to be a viable alternative, it only modestly shifts the safety risk from explosion to asphyxiation while doing nothing to eliminate the hazards of keeping gases under high pressure. Extraction by CO2 will still require closed-loop systems and large up-front capital investment to produce the desired extracts. A new Seattle-based company called BT Ingenuity has tackled the extraction process using a green chemistry approach. The company, founded by ACS member and ACS Medicinal Chemistry Fellow Tyrell Towle, uses a solvent that is ­biodegradable, does not bioaccumulate, and is nontoxic. The patented process does not require a closed-loop system and requires only minimal postextraction processing using Food & Drug Administration-approved ingredients. This new process eliminates the risk of both fire and asphyxiation for workers. It is highly versatile and provides control over the finished product. Finally, the solvent is recovered and can be reused in multiple extractions. The legal marijuana market will only continue to increase, and improved safety as well as green production processes will continue to be important for both producers and consumers. Innovative thinking will allow the industry to dramatically improve safety. Couple of things here. First, I agree that if there is one single thing that chemists getting into the cannabis industry should do, it would be to run the home butane hash oil business out of business. It's apparent to me that BHO is unsafe and causes tremendous amounts of injuries and property damage. A couple of pieces on the "skills gap"
Anyone seeing offers get reneged on?